For me, allowing people to understand science is a fundamental aspect of being a scientist. New knowledge is gained via scientific study, and it is our job to share that knowledge: the main route of which has been through peer-reviewed journals. However, it is important to engage with people who do not read the scientific literature. Louis Pasteur (1822-1895) is a great example of this. Famed for his breakthrough in microbial fermentation, vaccination and pasteurization, Louis Pasteur stands as a shining example of a world-class researcher. However, it is less known that Louis Pasteur was a keen educator. Pasteur believed that we should not just talk to students, we should engage with them on a practical level, with an emphasis on how to understand the science process . In the 119 years since Louis Pasteur, microbiologists have made some of the biggest contributions to healthcare cross the world. However, we live in a world where people refuse to believe or act upon scientific theory and evidence. 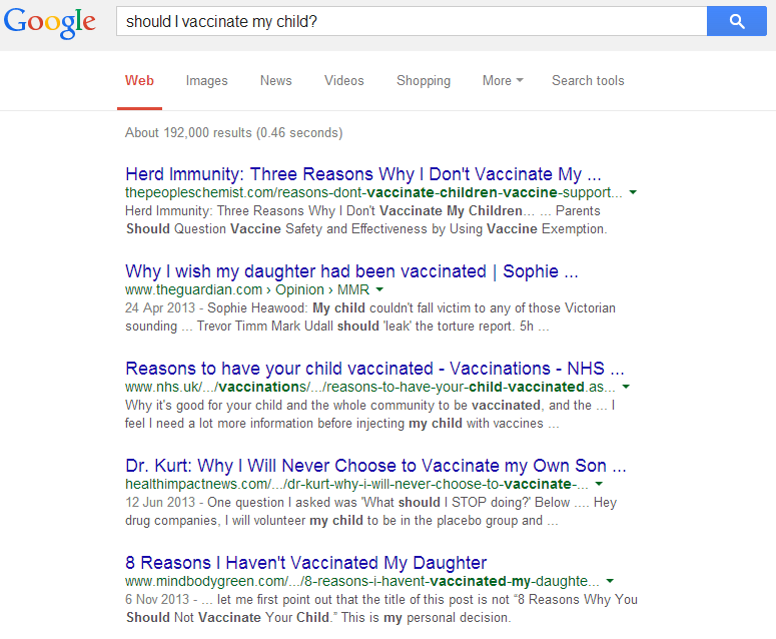 For many, the usual places to look for information (Google) is full of mixed messages about scientific evidence and what should be believed. 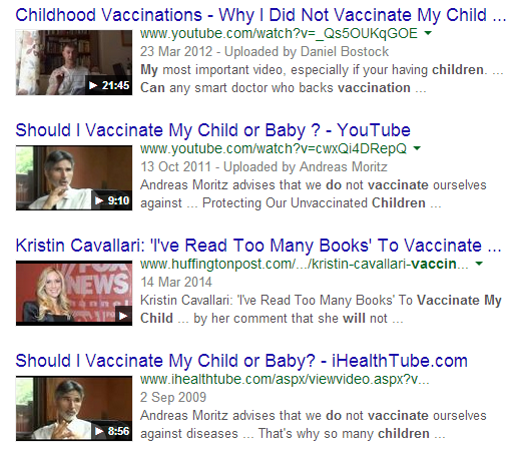 For example, see the results below of a Google and YouTube search from last week about the choice of vaccination, an issue which angers many scientists (including myself). Essentially the anti-vaccination movement stems from various issues (either real or perceived) including a distrust of scientists (who are believed to be funded by the big bad pharma industry) and, importantly, a lack of understanding of scientific evidence. After many years in higher education I am pretty confident I can assess a piece of science and understand its outcomes and implications, however, it could be claimed that some of these skills are missed from general education, and the underdeveloped scientific literacy of the general population has led to some confusion on who/what or how to understand ‘science’. Yet scientists cant be dismissive of this. Scientists themselves can often confuse matters. For example, in September this year, Frontiers in Public Health, a peer-reviewed journal, published an article questioning the link between HIV and AIDS (known as HIV/AIDS denialism). Much to the dismay of much of the scientific community (see Aetiology’s blog for a great overview of this debate). And these issues are likely to go nowhere any time soon. The way people access healthcare and information is becoming increasingly more diverse. It is not uncommon for people to Google medical symptoms, so much so, Google are considering a ‘Talk With a Doctor‘ feature to help people who seek information on their search engine. So for me, its evident that scientist need to play an ever-important role in shaping the way people interact with our findings and discovery, and the numerous issues that microbiologists hope to solve in the laboratory are not necessarily the whole answer. Well, WordPress, its been a while. Just days before christmas I successfully defended my PhD Viva. I immediately started my new job as a medical writer for a digital healthcare communication agency in Manchester (will hopefully blog about this soon), and since then have been pretty busy doing various things. But now, I’m back! So, how better to begin my new wave of blogging than by summing up the last four years of my life. Below is an article I wrote for the Society for General Microbiology quarterly magazine Microbiology Today May 2014 issue, about how unusual, unique, yet excitingly cross-discipline my doctorate is. Have a read. 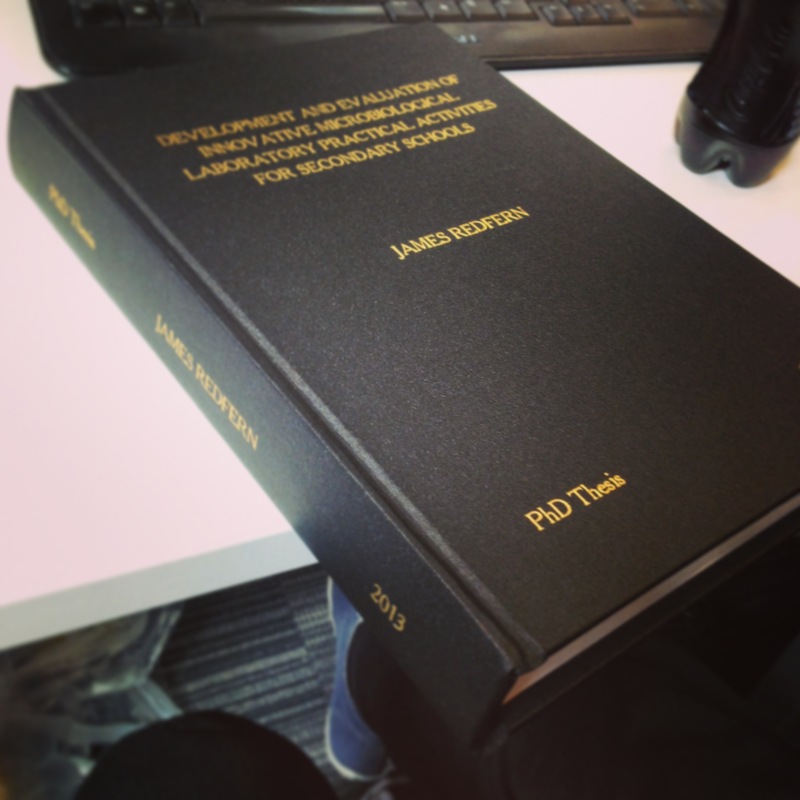 In December 2013 I completed my PhD at Manchester Metropolitan University, part funded and supported by the Society for General Microbiology. This was the accumulation of three years’ work combining microbiology, school science education and science communication. The project aimed to develop novel, exciting, and reliable microbiology laboratory activities that would be published and distributed to SGM member schools to help promote and encourage microbiology in the classroom. Our early investigations discovered that there was very little analysis in the literature of the current status of practical microbiology in the school laboratory. A survey of 248 teachers , revealed that only two thirds of teachers believed practical work was important in teaching microbiology and a similar number actually used practical microbiology in their teaching. Many of the limitations to teaching practical microbiology described (both real and perceived) included time constraints, cost, lack of equipment, lack of expertise and not enough support available. It was also clear that teachers focused on the relevance of all practical activities to the details of the curriculum, and that there was considerable demand for support from professional societies, and the expertise of their members. With this information to hand, I developed the resource entitled Algae: a practical resource for secondary schools , which contained five well-tested activities that supported many science curricula taught in the UK and aimed to address limitations faced by teachers. Written with consideration to current pedagogical thinking and the philosophy of science, the resource underwent stringent trialling (for design, readability, usability, ability to run activities successfully) with a range of audiences (including students, teachers and the public). An 18-month follow-up survey of users showed that the resource was being used as intended and that the activities were able to support topics across biology in over 22 biology teaching specifications (data which I am planning to publish soon!). A second resource ‘Viruses: a practical resource for post-16’  was developed following a similar process. The aim of this resource was to encourage the use of bacteriophage in schools, as an example of a relatively easy to handle virus, as well as PCR. This has been sent to all SGM school members and we hope for similar positive evaluation. As well as my work on practical microbiology for schools, I have designed and delivered a number of microbiology science communications activities at festivals and events across the country, many in collaboration and support with the SGM. Most notably, I redesigned an activity from the Algae resource so that it could be delivered to over 2000 individuals comprising different audiences in different environments . This was the main activity for which I was awarded joint-winner of the SGM Outreach Prize 2013 – for which I am very grateful. I couldn’t have completed the PhD without the time and effort of my supervisory team, particularly Prof Joanna Verran (MMU) and Dariel Burdass (SGM). My aim over the last four years was to promote the science of microbiology to a variety of school audiences. I think I have made a good start, but we must continue to build on and encourage projects like this to ensure that others can share our love of all things microbiology! REDFERN, J., BURDASS, D. & VERRAN, J. 2013. Practical microbiology in schools: a survey of UK teachers. Trends in Microbiology. 21(11), 557-559. REDFERN, J. 2014. Viruses: a practical resource for post 16 biology teachers. Reading, UK, Society for General Microbiology. ISBN: 978-0-9536838-4-0. REDFERN, J. 2012. Algae: a practical resource for secondary schools. Reading, UK, Society for General Microbiology. ISBN: 978-0-9536838-7-1. REDFERN, J., BURDASS, D. & VERRAN, J. 2013. Transforming a school learning exercise into a public engagement event: “The Good, the Bad and The Algae”. Journal of Biological Education, 47(4), 246-252. Having been watching TEDx talks via YouTube for quite some time, when I discovered a TEDx event was being held at the Royal Albert Hall, all about the interaction of science and art , I knew I wanted to go. Fortunately enough, I was able to! The power of seaweed – Julia Lohmann. Julia is design resident at the V&A. Upon a trip to Japan Julia encountered a particular type of seaweed, and using the mystical artistic abilities I seem to lack, was able to see past the ‘green stuff’ and enlighten the world with its unusual properties. Julia discovered that you could grow the seaweed and use it a little like Papier Mâché, turning the usually non-descript seaweed into some amazing sculptures. This was the walk I was looking forward to most – the problem with antibiotics. As someone studying and often discussing microbiology with students and the public, antibiotics is an issue I care a lot about. If you watch one YouTube video today, it should be this one. Whilst all other speakers on the day were discussing the interaction between science and art, and what they have managed to achieve with is, Prof Davies, the Chief Medical Officer for England quite rightly uses her TEDx slot to discuss antibiotic resistance. The talk begins with an introduction to the grave issue: not too long in the future, we will have no drugs to fight infection. This seems a little unbelievable at first, but unfortunately it is no exaggeration. Currently, 23,000 people die every year in the US due to antibiotic resistant bacterial infections, a number which is only likely to rise. I will leave the details of the talk to the YouTube video, however, I will emphasis Prof Davies key points. This has all recently been backed up by the first report of its kind in the US, the CDC Threat Report 2013. It is an issue that needs to be taken seriously. It is something I hope to come back to soon and blog in detail about, however, in the mean time, watch this video! 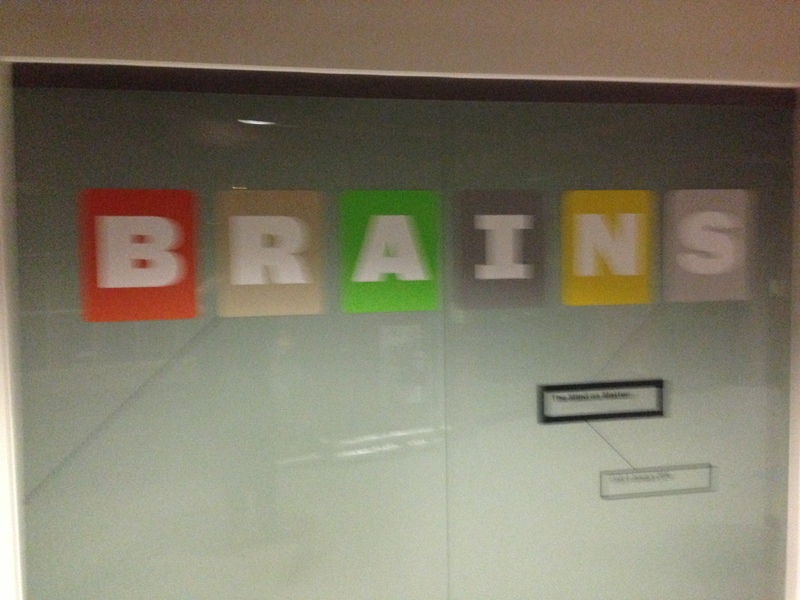 Brains@MOSI – the Museum of Science and Industry – Blogger event! A few weeks ago I discovered that the Manchester Science Festival (MSF) was looking for bloggers. Having recently started this blog (after many years of ‘nearly’ starting one) I decided this would be a good opportunity ! After a hard day of thesis writing on Tuesday 24th September, myself and fellow sci-commer Jo Keogh put down our work and walked down to the Museum of Science and Industry (MOSI) in Manchester, UK. Brains at MOSI is a fascinating exhibition currently on display at the museum. The exhibition, part of the Wellcome Collection has been open since 26th July and will remain open to all (for free!) until the 4th January. As part of the blogging evening the MSF had put on for me and my fellow science and/or art bloggers, we were to get an extra special, after hours, personalised tour from the exhibition curator, Marius Kwint. The exhibition really is fascinating. It displays a range of specimens, art, photographs and various other pieces representing the brian. The exhibition has relocated from London and developed a local spin, with many pieces sourced straight out of the University of Manchester, demonstrating Manchester’s history of neuroscience. For me the event was not what I had expected, as a biologist I am used to thinking of the brain in a very particular, anatomical way. Seeing the specimens of brains knocking around took me back to my days in my American anatomy class, poking human brains trying very hard to remember all the nerves, however, with the help of Marius, I started to think about things a little differently. The exhibit really does make you think about the brain past the thing that makes us think. It covers not what our brains can do for us, but more what we can do to/with our brains. Being toured with artists and non-academic scientists really helped me appreciate the exhibit past my blinkered sciencey view, opening my eyes and imagination, making me think about something in a new way that i’m used to seeing in a particular way. All in all the evening was very enjoyable, and I am now very much looking forward to feeding back my thoughts on events taking place over the week of 24th October to 3rd November. If you haven’t done already, be sure to check out the MSF line up, its as stong as ever, offering something for all. On the 14th June of this year (2013) I got up extra early and wandered on down to London for the day. I had received an email from the Society for Applied Microbiology (SfAM) a few weeks before, asking if any of their student members (of which I am proudly one) would like to attend the free Voice of Young Science – Standing up for Science media workshop for event. Having looked into I decided it looked fun, and as I have a somewhat significant interest in how science is communicated to the public, I deemed it very relevant and applied to SfAM for a space. 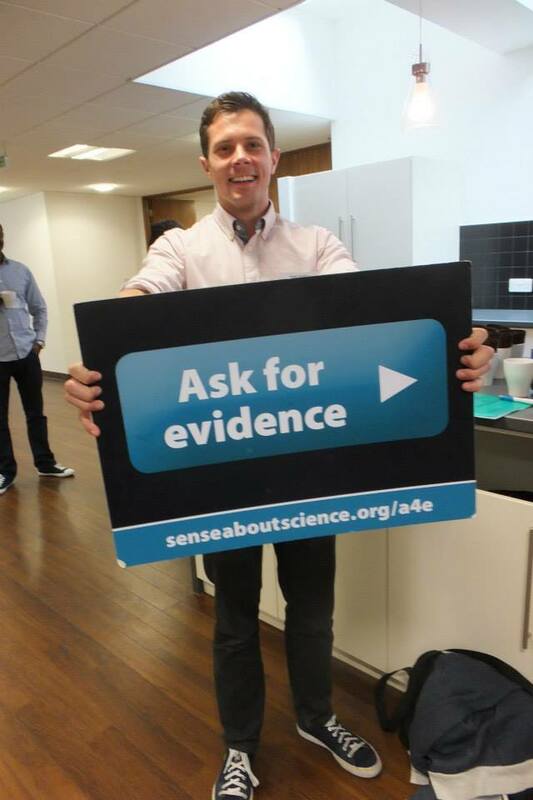 For those of you who have never heard of the organisation Sense about Science, they aim to provide people with the tools to make better judgement on scientific fact and evidence, or maybe more importantly, what is portrayed as scientific fact or evidence. Science, and my area of interest, microbiology, is no stranger to misinformation of scientific evidence causing issues with greater society. Examples are numerous and ever increasing in numbers, from the wrongly popular unproven link between MMR vaccination and Autism to the more extreme view held by some that HIV does not cause AIDS, to the disbelief of the widely accepted theory of evolution. In all of these cases, science has been misrepresented, either by the media (MMR), by people who apparently refuse to acknowledge hard scientific evidence (HIV) to people who don’t seem to understand what evidence is, and how it should be used (evolution). Regardless of what personal views people hold, it is well acknowledged that the media have a great power in supplying science to the people, after all, how many non-scientists will read through scientific literature instead of watching BBC Breakfast for their fill of science? The day was held at the Society of Biology, in the aptly named Charles Darwin House (the home of a few biological learned societies). The morning sessions were focusing on scientists experience with the media. A panel of four scientists gave their stories/experiences of working with the media to share their scientific knowledge or expertise. There were some interesting stories, examples of good journalism, examples of bad journalism, and a mix of thrill and fear. What I took away from the morning session, following a few questions from the floor, was that scientists want to share their stories, but can be wary of the big bad evil media. Following some coffee (which I managed to spill everywhere – standard) and lunch, we began to debate what was important in terms of scientists communicating with the media. In our group, one man made the argument that journalists didn’t seem to care about the science, and were only after a soundbite. In a newspaper report on his work, the journalist would only talk to him for 5 minutes, giving his story 200-300 words. He felt this was unjust as it would take at least 15 minutes of explanation for anyone to understand his work. His thoughts were generally disagreed with our discussion group, and I explained that if his story took a 15 minute explanation to understand then it wasn’t really suitable for the media, but he could not understand how this was true, as he felt his research to be highly important. This highlights an interesting point, scientists must take a step back from their work and evaluate what is really important to the public? This conversation alone is evidence that science communication to non-scientists, in terms of current scientific research, is far from being understood. The afternoon session turned the tables on the scientists. It was time for the panel of journalists. Of course these were all good, upstanding journalists, representing the BBC, Nature and a freelance health writer. They gave accounts of the pressures they are under from editors, and the requirements of scientists to be available when they are needed. Suddenly the floor of scientists were quite on the ‘evil journalist’ front, as I believe they started to understand journalists were not out to destroy their scientific career, but instead wanted to tell the stories scientists had to offer, but themselves have a difficult job in being able to achieve this. I would certainly recommend this workshop to anyone with an interest in talking about their research to the media, and in particular would like to draw attention to the other things Sense about Science does, including the ask for evidence campaign, which I hope to write about soon. This week I was fortunate enough to be awarded the Outreach Prize from the Society for General Microbiology. The prize, sponsored by Yakult, is awarded “to a microbiologist who has engaged in high-quality outreach activities during the last 2-5 years”. The award has been presented annually since 2009, and I am the first guy to ever win it, which is interesting in itself! I was invited to give a prize talk at the SGM Autumn conference in Sussex, and unusually, the award was presented jointly, sharing with me is Helen Brown (Institute of Food Research, UK), who has done some great work in promoting microbiology to the masses. Our work has taken somewhat different routes, but with very similar outcomes. Over the years of my PhD I have been involved with a lot of public engagement events, focusing on many different aspects of microbiology (including hand hygiene, oral microbiology and viruses) to a range of different audiences (school students, the public, families and educators), but I chose to discuss one particular activity, which has ‘grown’ over the years, and has developed its own story and (hopefully) legacy. Here is a very brief overview of what I did. ‘The Good, the Bad and the Algae’ was first conceived for the National Science and Engineering Week in 2011. We sent out the word, and very quickly our three 1 hour sessions were fully booked. 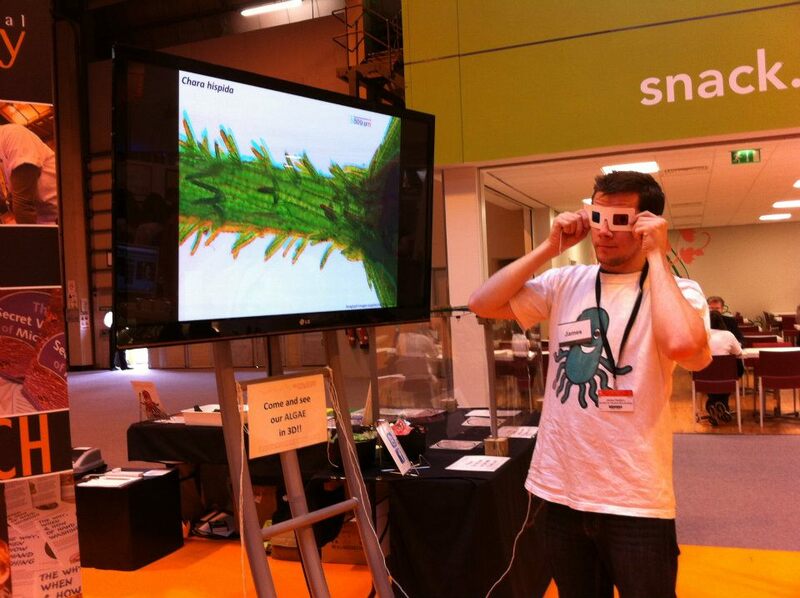 Over the space of a day, we immersed 60 people into the world of algae. Many people disregard algae as a microorganism, and given their importance in the world around us (for example oxygen production and their involvement in many common products we use), we decided they needed someone to fight their corner. The sessions began with a small introduction, after which, using an ID key developed for the activity, people where left to identify 9 ‘unknown’ species of algae. 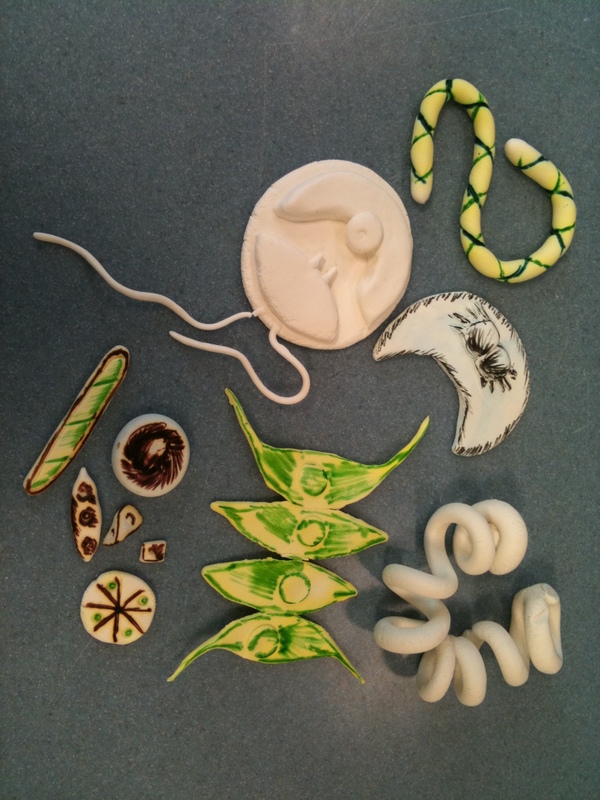 Additionally, we provided modelling clay for people to make models of their favourite algae to take home (in case they got bored in the hour long session!). However, nobody got bored, and with a friendly and productive atmosphere, most people went through all nine species, marvelling at the shape, colour and movement of the various samples provided. The event was a great success, we were very happy with it, and asked the SGM if they would like us to write it up for their magazine Microbiology Today (Redfern, 2011). After discussion with the then outreach officer at SGM, we decided to take the event to the national Big Bang Science fair in 2012, which was being held in Birmingham. This provided many issues and made us rethink how we approached the event. We would no longer have a calm 20 participant lab with new microscopes. Instead, we would have a few tables, and potentially thousands of children turning up in any order or number. So we rethought a few things. We got hold of some very nice microscopes with LCD monitors built in, which allowed us to show the species of algae to a group of students, instead of individually. We also reduced the number of algal species to make things a little more manageable. Also we added some 3D images of algae (to draw attention) and a new activity on the scale and size of microalgae, using 2cm Plastacine models (made by the students) and a perspex box, we were able to show just how many algae could fit inside half a drop of water. Over the three days of the event we engaged with over 2,200 people, with over 800 making an algal model for our water drop. Additionally, students were asked (via post it notes) what piece of information they had learned from the event, with over 50% of those responding suggesting they took something scientific from our activity. Since this, we have published the story as a case study in the Journal of Biological Education (Redfern, Burdass, & Verran, 2013). Just like Helen, I have gained a lot from my work with public engagement, not only does it provide the usual ‘transferable skills’ etc., but it builds confidence, and more importantly, communication skills, something which is becoming more and more important in the world of science. I am very grateful to the SGM for awarding me this prize, a very nice end to my PhD, and of course this story could never have happened without a large amount of input from many other people, notably Prof Jo Verran (MMU) and Dariel Burdass (SGM) and attendees of the British Phycological Society winter meeting in 2012 for their ideas and input. Redfern, J. (2011). The Good, the Bad and the Algae. Microbiology Today, 38, 189. Having just received an email from wordpress encouraging me to be a better blogger (! ), I think I should write my first proper post. As I sit here looking at the draft of a new educational resource for post-16 education I have written (all about viruses), I think I will share some of that with you. I have always been fascinated by scale and size of small things (which I suppose is why I love microbiology so much), but imagine living before we knew exactly what was out there? Not really understanding how tiny microscopic microbes could affect us in such a potentially devastating way! One story that caught my eye is all about linking myth with science. Various unusual phenomena, which were at one time unexplainable, can now be attributed to microbes. One interesting story is the tale of the Jackalope (Lepus temperamentalus). First spotted in 1829 in the United States, this mythical creature is said to have the body of a rabbit with the horns of an antelope. American folklore says the creature would roam the countryside, causing chaos and playing tricks on cowboys (the Jackalope was able to imitate human voices, often repeating shepherds singing to their flock). However, people were keen to find them as their milk apparently held medicinal properties. Although they were shy animals, they could become dangerous if approached. They were very rare and not often spotted, which was said to be because they could only breed during severe electrical storms. In 1933 the science underpinning this unusual, but often believed myth was brought to light. Dr Richard Shope (the man responsible for also discovering the flu virus) with the help of Dr Francis Rous determined that a virus was responsible for causing cancer in rabbits. At this time, it was unknown that viruses were able to cause cancer, so this was quite a discovery. Known as Shope papilloma virus (or SPV), infection can lead to the development of hard tumours (usually on the head), which can look like horns. It is now commonly believed that any sightings of the ‘Jackalope’ were probably an unlucky rabbit that had been infected with SPV.